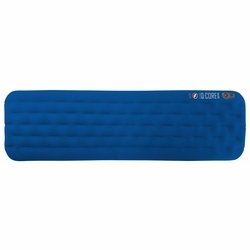 Big Agnes Q-Core Deluxe Sleeping Pad. The new Q-Core Deluxe has become the most comfortable sleeping pad on the planet. This pad utilizes minimalist I-Beam construction to reduce weight and provide consistent stability, built-in advanced heat-reflective technology, and an ultra-comfortable and super-quiet quilted top that provides a cushioned pillow-soft sleeping surface. Larger outer chambers keep you comfortably cradled in the middle of the pad no matter where your camping adventures take you.